Fruit tree Planting & Care Tips | Faddegon's Nursery, Inc.
Now that you have selected your fruiting tree, there are a few things that are essential to know. Three considerations are important in choosing a spot for your tree: Sun - Fruit trees need at least a half day of sun. Soil - Soil must be well-drained and fertile. Heavy clay soil must be amended before planting. Space - Fruit trees like air flow and sun. Plant 12-14' from each other. Dig hole slightly LESS deep than root mass. For container plants: Remove plant from container, cut or pull away any circled, matted or tangled roots. Set plant in hole so the crown is slightly higher than ground level. DO NOT plant the bud union below the ground. Amend soil with organic matter, such as peat, manure, or planting mix. Mulch 2-3" deep with bark mulch. Water thoroughly. The Survival Of Your Plants Depends On It. Water all plants thoroughly when first planted. Soak thoroughly to depth of root ball Deep watering once a week for sandy soils. Deep watering every 10 days for clay soils. Water more frequently during first month after installation and during unusually hot, dry periods. Water with a soaker hose, avoiding light surface sprinkling, or let hose run at a trickle at base of plant for 3-8 hours for thorough watering. A 12 hour steady rain substitutes for a normal watering. Thunder showers run off quickly and should not substitute for a thorough soaking. Continue this program until the late fall and then again the following year, if necessary. Spray trees with horticultural oil in spring. Spray when temp is 40 degrees and before tree leafs out. You may spray twice with 7-10 days in between. This will be immensely helpful lessening the need for pesticides later on! Apples and Pears - Late winter while tree is still dormant. In mid-summer, you can prune to control aggressive growth. Cherries - Late spring or summer. Any other time is not good for cherry trees because disease can affect them if pruned in cool, wet weather. 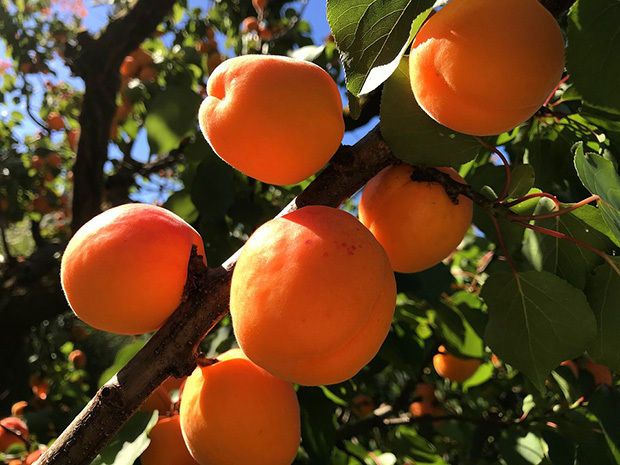 Peaches, Nectarines and Apricots - Early spring is best after last frost date (mid-May in the Capital District) Plums - Winter for major cleanup and shape. Again in mid-summer to contain the shape. Plums are aggressive growers. You can't over-prune a plum tree. Agressive pruning is advised for fruit trees! Done annually, this will maximize fruit production by producing a vigorous plant. The pruning done the first year will determine the shape of the tree in general. After planting, a fruit tree should be pruned down to 4'-6' above the ground. Take out inward pointing branches. Take out branches crossing each other. Trim off tips of larger branches. Take off "suckers". These are shoots coming off the tree below the bud union. Keep doing this annually until the tree is older and suckering slows down. Thin out fruit. If you leave too much fruit on the tree, they will be smaller and ripening will be tougher. Try to leave about 8" between fruits the first year, continuing to thin in subsequent years. As the tree matures, you will want to continue to trim for shape. Apple, pear cherry trees - leave a central leader. Think of a fat Christmas tree. Peach, nectarine, plum, apricot - make a vase shape. No central leader. All main branches reach up. Always remember that it's difficult to over-prune a fruit tree.